13-Amp is a character that appears in WarioWare Gold. She is a self-proclaimed "rapping phenomenon" and serves as the antagonist during 18-Volt's segment in WarioWare Gold's story mode. She makes three appearances throughout the game as a whole: the first being in 18-Volt's segment, the second in the Ultra League's Dancing Team, and finally in the credits. 13-Amp wears a white shirt with dark blue sleeves that match the color of her pants. 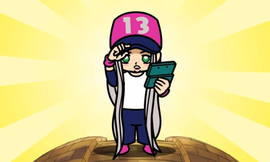 She wears pink shoes, a wristband, and a cap marked with the number 13. She has emerald eyes, puckered lips, and long silver hair. 13-Amp herself appears to be in her teen years, judging by her remark of how she was "bested by a 4th grader". 13-Amp first appears when she takes the Nintendo 3DS and games of Ralphie on Emerald Street. She is then challenged to a rap battle by 18-Volt for Ralphie's games back. If 13-Amp loses, she has to return the games. If she wins, she gets to keep 18-Volt's games. Eventually, 13-Amp loses to 18-Volt; after that, the two depart, stating they'll have a rematch sometime and with 13-Amp being shocked that she was beaten by someone attending elementary school. She later appears in the Ultra League as a DJ for Joe's Club, and then finally with 18-Volt in the credits, where she is holding a Nintendo 3DS. It is also revealed, through one of the phone messages, that she had only recently moved to Diamond City and has trouble making friends. Her mother describes her as the "shy and bookish type". Rank C – 13-Amp is the best rapper in her high school. Her parents might not approve of it, so she keeps this a secret. Rank B – A rap she's working on: I'm not like the wind–no easy flow. I'm a tornado. Duck and cover, yo! Rank A – A rap she's working on: Got my cap and I'm ready to rap. Ain't gonna stop until it's a...wrap? This page was last edited on April 3, 2019, at 22:01.